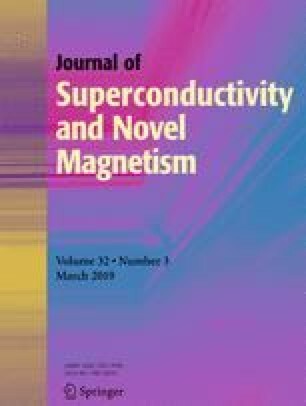 Highly oriented Cr-substituted Ni55Mn34Sn11 Heusler thin films having thickness ~ 400 nm were deposited by Ultrahigh vacuum dc magnetron sputtering on MgO (100) substrates. At room temperature, the films exhibit a mixture of dominant L21 cubic austenite phase, as revealed by the intense (002) and (004) peaks, along with small fraction of the orthorhombic–martensitic phase. Surface morphology of the thin films showed distribution of Cr-rich and Cr-deficit regions together with patterned and aligned magnetic domains, thus bringing out the inherent room temperature ferromagnetism of the film. At temperatures above the Curie temperature, TC ~ 321 K, the magnetic behaviour of the films is seen to follow the Curie law rather than the Curie–Weiss law. Ferromagnetic to antiferromagnetic transition appears at TN ~ 247 K, which gives rise to exchange bias at low temperatures due to the coexistence of the two magnetic orders. This phase coexistence also leads to the formation of a spin glass state deep into the martensitic region. The film exhibits metal-like nature at high temperature and semiconductor-like behaviour with the lowering of temperature. A reentrant metallic state is observed at T ≤ 38 K during cooling that persists up to ≤ 62 K in warming cycle. The hysteresis in the ρ–T curve spread over a very wide temperature range confirms the magnetic phase coexistence in the martensitic state in the present thin films. The magnetoresistance (MR) first increases (2.4% at 300 K and H = 50 kOe) with temperature and maximizes to around ~ 3.25% at T = 150 K and then starts decreasing. Its value in the glassy state is very small. This shows that a magnetic liquid like state is more conducive to larger MR.
One of the authors (BB) would like to thank DST-INSPIRE for providing the INSPIRE fellowship. The authors would like to thank Dr. K. K. Maurya for the HRXRD and Dr. Kedar Singh (JNU) for R-T measurements. The authors are also thankful to Director, USIC-University of Rajasthan, Jaipur for the use of the SQUID magnetometer facility created under the UGC-UPE program ‘Focused Area’ for magnetization measurement. The authors would like to thank Mr. Sandeep Singh for the MFM characterizations. Major equipment funding has been provided by the Council of Scientific and Industrial Research (CSIR).